If You Use Our Faces Maybe Stop Killing Our People? I'm going to be blunt: being Muslim has become the next hot identity -- to claim, to wave around above your head, and to profit from. The mainstream seems to desperately cling to, and want to claim, whatever identity-based hashtag is highest on the "now trending" Twitter ranking, from non-Black people holding signs claiming "We are ALL Trayvon Martin" to white people suddenly discovering that they are 1/32 Cherokee so Standing Rock is their fight as well, and now, apparently, #IamMuslimtoo. And if one industry knows its trends -- and knows how to capitalize on them, fast -- it's the fashion industry. So you've come to the right place. Welcome. As a Muslim, hijab-wearing fashion blogger who gets pitched by brands all the time, I can tell you first hand how within the last year brand pitches I received have shifted from "we appreciate your work and believe we have similar values and visions and would love to collaborate together" to "now that Muslims are trending in the media pls wear our clothes so we can seem hip and edgy OH yeah and we have zero compensation for you." In the past year, as the refugee crisis finally began to receive a fraction of the media coverage it deserves; hate crimes against Muslims continued (and continues) to rise in the USA (more drastically than any other identity-based violence--up by 67% even before Trump's election); anti-Muslim racism at the individual, local, and federal levels remains unchecked and without its usual liberal facade of tolerance for Muslims; and Muslims (mostly Muslim women of color) worked to take up more and more space and unapologetically call out the increased bullsh*t of our environment, the image of the hijab-wearing woman shifted from a brand not many companies wanted to be tainted with to the next hottest trend. While thick eyebrows are "in" right now, I remember wanting to pluck my thick, unkempt eyebrows right off my face as a kid. The first time someone complimented my eyebrows I thought it was a joke and laughed. Of course, while usually a signed model has little agency in how she's portrayed and used by fashion designers -- which is a rant post of its own -- this is still an important move. Representation is, obviously, deeply vital. Halima Aden, the first hijab-wearing Muslim model signed by IMG, born in a refugee camp in Kenya. But now let me go back to being angry. my identity is not your gateway to staying on-trend. 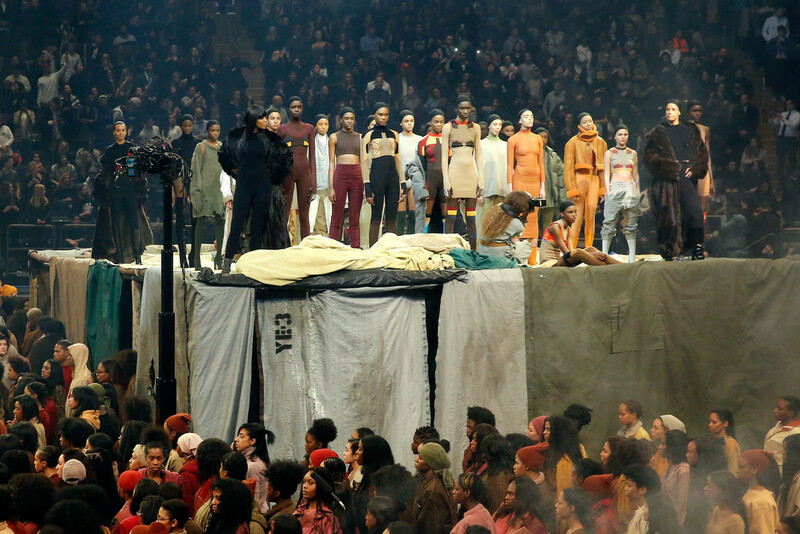 How can we applaud Kanye for using Aden in his runway show (or even more disturbing, his "refugee line" last year) when he simultaneously endorsed Trump -- the same current regime leader who vowed to (and already temporarily did so) ban refugees fleeing from the violence he and his predecessors have caused? Sure, Kanye has apparently since withdrawn his endorsement, but not without intense public pressure and outrage, only proving further the point that he, and others like him, simply jump on whatever seems to be "hot" at the moment with little to no understanding of what the hell that means. There is little value in using visibly Muslim models if you are going to be killing and exploiting --directly or indirectly -- their families back home. + White House Eid Dinner | The Obamas -- and presidents prior to him -- invited Muslims to the White House to celebrate the end of a month-long fast during Ramadan. Meanwhile, he administered drone strikes that killed an 8-year-old playing outside as her grandmother, Bibi Mamana, was also preparing festivities for the very same event (and who also was severely injured as well). You cannot be pro-war (or "war on terror" drone strikes) and support Muslims. + Zionist, pro-Israel people and organizations pledging solidarity with Muslims | Sure, solidarity is great, but not from individuals and organizations who simultaneously contribute to--and profit from--the demonization of Muslims: Israel remains an inspiration to many of Trump's anti-Muslim, anti-immigrant policies (such as "the wall") and Zionist groups such as the Anti-Defamation League (ADL) continue to be one of the largest funders of anti-Muslim propaganda in the USA and Europe. You cannot be pro-Israel and support Muslims. + Fast-fashion & "the resistance" | If a Forever21 shirt says "womens march!!!" with a few fists and pink hats we jump with excitement as if the billion dollar company that exploits women globally has suddenly became a feminist symbol, gone rouge, and joined the resistance. 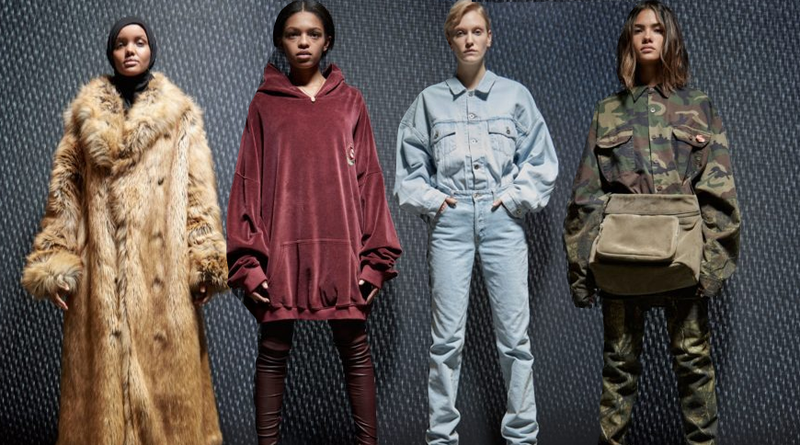 Let's just say, fast-fashion is far from "going rogue"-- nor can they until they start their "resistance" from their sweatshops abroad. You cannot buy images of resistance from billion-dollar, exploitative companies. 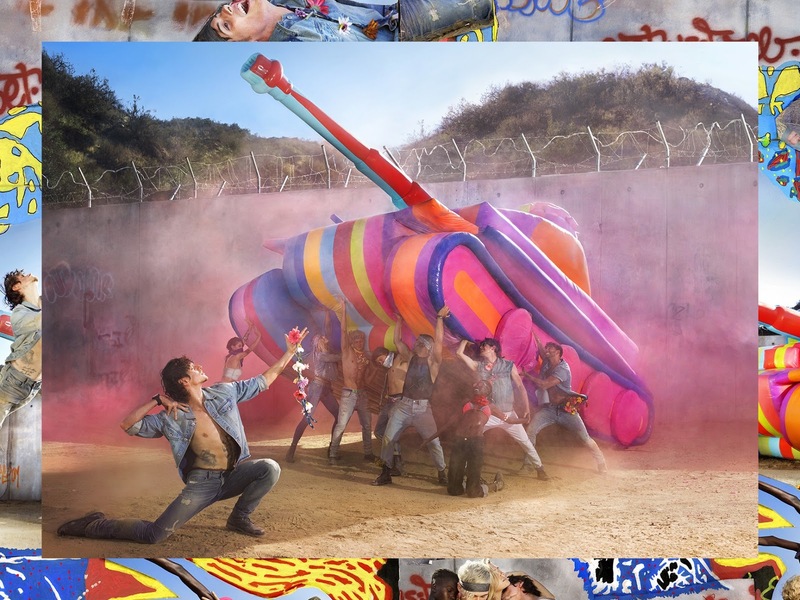 An image from Diesel's new SS17 "Make Love Not Walls" Campaign--and yet, they continue to use toxic and harmful chemicals in the production of their clothing. Hard to "make love" when everything around you is contaminated, c/o irresponsible production methods! 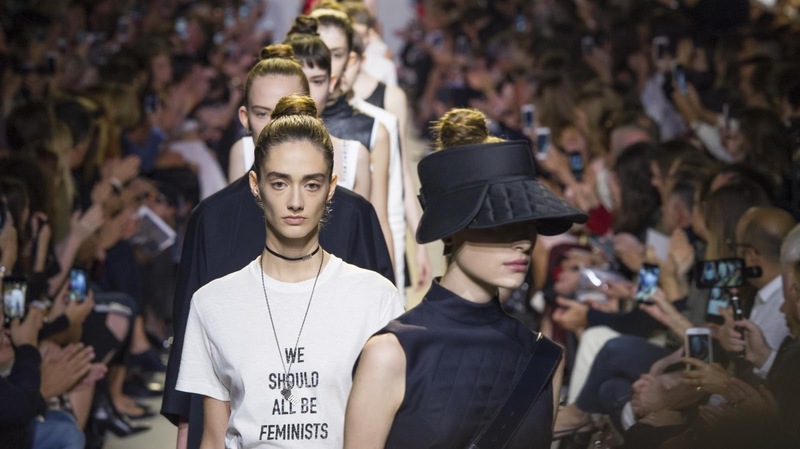 And here is the key question to everything we've discussed so far: How are the deep contradictions of many fashion houses, designers, and others pretending to support and represent hijab-wearing women (or "the resistance") in order to stay politically on-trend able to get away with failing to do so when it comes to their own politics or company practices abroad? The over-emphasis on the hijab as synonymous to the Muslim identity essentializes and flattens what it means to be Muslim and allows the Muslim identity therefore to be easily appropriated and exploited for social, political, and economic benefit. Our complex experiences, relationships to faith, personal understandings and values of symbols, varied and diverse histories of colonization and displacement, are all quickly homogenized and flattened and represented by a single symbol: the hijab. When your entire identity, history, experiences, and culture can be represented by a single piece of cloth, it instantly becomes easier for people to think that wearing a hijab for a day means experiencing the life of a Muslim, or draping a hijab over a model means you support refugees -- without having to change any of your harmful practices behind the scenes that are actually directly harming Muslims. Not to mention that this simplification and essentialization of the hijab as "the" Muslim identity is harmful to many non-hijab-wearing Muslim women in the West who now feel compelled to wear the hijab only as a prerequisite to being able to claim the "Muslim woman" identity, rather than deciding to wear it (or not wear it) as a deeply personal and spiritual decision. So not only is this tokenization and shallow over-saturation of "Muslim imagery" in fashion and beyond allowing people and companies to get away with exploitation of Muslim women behind the scenes, it also strips the hijab itself of value, as it is being introduced, represented, defined, and used in different spaces by non-Muslims who do not themselves understand what it is or what it means. To them, it is simply the latest trend. Sure, the argument could be made that such an over-saturation of fist and protest sign imagery and hijabs could work to normalize Muslims and resistance to the Trump regime and encourage more white people to come out to protest alongside people of color who have been protesting and resisting since the first Indigenous person was massacred and Black slave was forcibly brought over, but what is a "resistance movement" that is fueled and imagined by billion dollar companies that continue to destroy the environment, exploit women, and tear apart families abroad? (or are non-Americans not worth your time and solidarity? See point 6 in this piece). As I've written before on JooJoo Azad, politics is deeply entwined with fashion. Political trends quickly become fast-fashion trends, and while political rhetoric and imagery can be powerfully transposed onto fashion and clothing to create shocking editorials that challenge the status quo, if the use of such imagery is created by someone who doesn't know the first thing about the experiences and identity of those they are trying to replicate and and the only people benefiting from the use of such imagery are the pockets -- and social image -- of billionaires, maybe we should rethink buying that "womens march" t-shirt from Dior or clapping for Kanye. Movement art is essential. But just like Shepard Fairey's harmful depiction of an American-flag clad hijabi woman, if those movement images are not being produced by -- and, ideally, directly benefiting -- the people these pieces seek to depict, represent, and support then maybe the image might not be as politically charged, "powerful," and worth purchasing and investing in as they might seem (unless of course you're drawing your oppressors for the intention of depicting them as you see them -- then by all means, please go ahead). Please note that these images might have just been created for nothing more than a vehicle for personal economic and social profit at the expense of whatever identity is highest on the trending hashtag list that week. The violence I face as a hijab-wearing, Iranian-American daughter of immigrants in a country that has imposed devastatingly harsh sanctions against my family abroad and produces enough anti-Muslim propaganda to get me called a terrorist and flipped off as I'm reading my book on the subway, is not an experience that you can simplify into a hijab and wear for a day or drape over a model to hide your problematic politics, anti-Muslim company practices, or the fact that these systems of oppression I face are created to directly benefit you. Sometimes it's important to look at the tags before deciding to invest in the message. P.S. Sorry for the radio silence these past weeks. I blame the Muslim Ban for keeping me busy. P.P.S My book tour dates have been vaguely announced! If you live in NYC, SF, LA, or Oakland, get in touch!